We’ve done Number Stories at the Park and played with a Number Stories Store. Now, I’ve got five more quick ideas for writing number stories. The ideas are quick, simple, and designed to show you just how easy it is to incorporate math practice into your day-to-day life. Life it busy. (That’s an understatement, isn’t it?) But, no matter how busy life is, all you need is 5 minutes for some quick math practice with your kids. 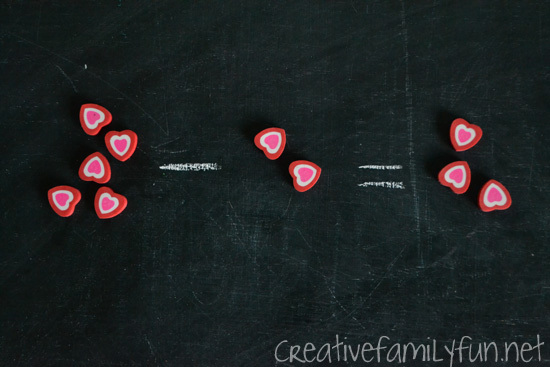 Here are 5 super-simple, super-quick ways to practice writing number stories with your kids. If your child loves drawing, combine math with art. Have them draw a picture of a number story. 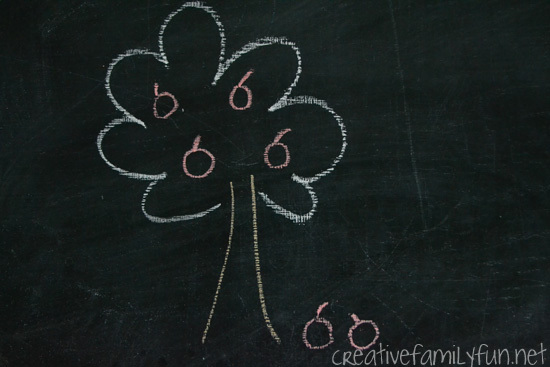 It may be as simple as an apple tree. An apple tree had 4 apples. 2 fell off. How many apples are left on the tree? Or it can be as elaborate as your child wants it to be. The premise is simple. Use drawings to help tell number stories. Combat boredom in the car by making up number stories. Use the scenery outside the windows to help you out. Take turns making up number stories and solving them. An example may be: I see 5 trees on the right side of the road and 7 trees on the left. How many trees are there altogether? This is also a quick way to practice math while you’re driving back and forth to activities during the week. Do they love super heroes? Or maybe your child is completely into dinosaurs. 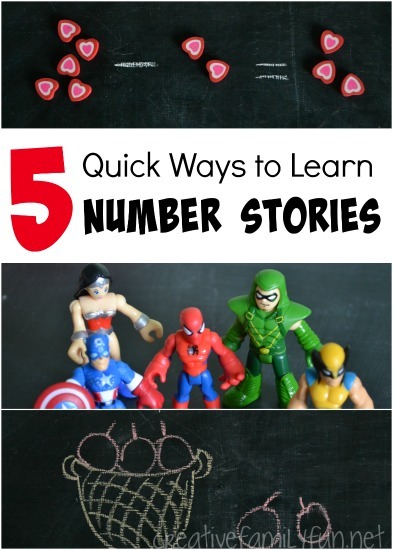 Whatever the favorite, use your child’s favorite characters to help illustrate number stories. Captain America fought 3 villains and Spiderman fought 4 villains. How many villains did they fight altogether? Use toys if you have them or pictures in a book. Or, you can just take turns telling number stories to each other. 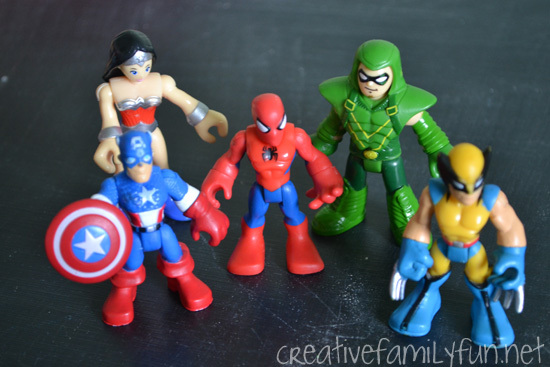 Let your kid’s favorite characters play a starring role and you’ll have a fun twist on math practice. We went on counting walks when the kids were younger. But, now that they’re older, those counting walks can turn into number story walks. Use the things you see as inspiration to create number stories during a walk. I see 3 green houses, 2 white houses, and 1 grey house. How many houses are on this block? Sometimes kids just need to use their hands and move things around in order to “see” the math problem. Manipulatives (any small thing you can use to count) are a great way to illustrate math problems. Use tiny erasers, rocks, beads, LEGO blocks, or anything small item you have. Use them to help solve your number stories. For example: If you have 5 heart erasers and take away 2, how many hearts do you have left? Math practice can be so easy! Use any or all of these ideas to help your child practice writing number stories. Maybe one idea will work better than others. Or maybe you keep all the ideas in mind so you’re not constantly doing the same type of math practice over and over again. You can have fun with math! What are number stories and why do I keep talking about them? Click here to find out.